This is more or less what FVWM2 looks like in its default mode. Since I've used 640x480 for these screenshots, everything is a little compressed. Notice the icon manager and the virtual desktop manager in particular - these are staples of FVWM. This is what FVWM2 looks like in its BlackBox clone mode. The appearance is remarkably similar, and the behaviour, while not identical, is also quite similar to BlackBox. FVWM2 has a bunch of other themes, equally detailed and mostly quite different from each other. The taskbar was evidently designed for a larger-than-640x480 resolution. 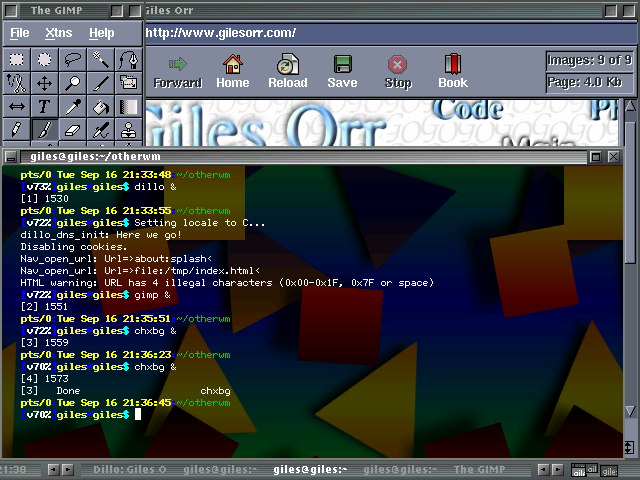 I used version 2.4.16, the most recent stable release in September 2003. The most recent development release is 2.5.7. Both are dated May 30, 2003. With the themes package, FVWM is extremely themeable. That includes behaviour as well as appearance. Quite a few very good themes are available. 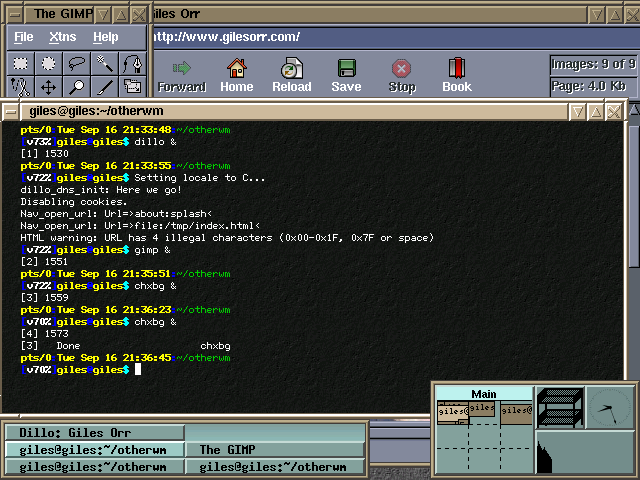 I first started using FVWM on Slackware in 1994, a 1.x version. I never did like its appearance (which was considerably less flexible at the time than it is now) or feel. I left FVWM as soon as I could for IceWM, which felt better to me. I wasn't looking forward to revisiting FVWM, but I was pleasantly surprised. I find that FVWM has improved immensely with age (and it is pretty damn old ...). If you load the "themes" package, FVWM becomes one of the most themeable of all WMs. (I don't think they support shaped windows.) Behaviour is pretty flexible too, and that may take care of my complaints about feel. The default behaviour is to use several workspaces, each of which contains a huge virtual desktop. A slight push on the edge of the screen flips you from one part of the desktop to another, a behaviour I've always disliked (a matter of personal taste). The good news is that like almost everything about FVWM, the edge resistance is configurable. To get themes, add the "fvwm-themes" and "fvwm-themes-extra" in addition to the "fvwm" package (if you're an RPM user). Then add "exec fvwm-themes-start" to your .xinitrc (or appropriate config file). This is definitely the way to go with fvwm, unless you feel a desperate need to edit the extremely complex .fvwm2rc file yourself ... Like most mature applications, FVWM has developed its incredible flexibility through the use of an extremely complex RC file. I've dug into the CTWM config files, but I didn't have enough time during testing for this report to get into the FVWM files. When you switch themes, artifacts of the last theme are sometimes left over. This turns out to be a feature, not a bug: it's possible to pick and choose parts of several themes to construct your own. Parts you don't like can be eliminated. If a particular theme doesn't use a module that the previous theme does, that module is left over from the previous theme. Ultimately, this is probably a good thing, but it takes some adjusting to. FVWM will remember the theme-state you leave it in and restart with the same appearance and behaviour. I'm still mixing and matching to find my ideal Frankenstein theme. One other issue I have with FVWM2's default behaviour (like so many things, it can be overridden) is its extremely old-fashioned icon handling: it actually minimises applications to an icon on the desktop. Remember Windows 3.1x? But you can convince it to use a taskbar (although that's flawed too in my opinion, as it shows all open apps - not just the ones in the current workspace. This can lead to a very cluttered taskbar). Extremely flexible appearance and behaviour. Can be made to look very nice. Can be made to behave the way you want it to. Relatively small memory footprint. Nasty basic look. Nasty default icon handling. Theme switching very slow on PII-233 with 64 meg. Mailing lists, wiki, IRC, themes ... It's all there and apparently quite active.